Educating the public on the truths of Agriculture, from animal treatment to crop production. Bill Nye is Pro GMO! In a recent article on the Washington Post, Bill Nye reversed his stance on GMO’s after investigating GMO’s at Monsanto. In the article Bill Nye said he wanted to understand the science behind GMO’s and how they were being used. What Bill learned was that science is just speeding up the genetic changes to plants as they breed over the years. Bill concludes that since his visit to Monsanto, he will be an advocate for GMO’s and not against them. To read more about this, see the article on the Washington Post’s website. Where do you stand? Do you understand the science? Do you trust Bill Nye? Comment below! How do we determine a GMO? Please re-read the title of the post and comment below on how you think a GMO should be determined… Thanks! Keep everything respectful and everyone’s opinions are welcome! When we look back at the history of the world and look at the history of agriculture, we start to see a selective process develop. Agriculture was the end of nomadic period for human history. With the beginning of agriculture, the beginning of selective breeding and reproduction for plants and animals was upon us. For thousands of years since, humans have discovered that by selective breeding and reproduction, we could continue specific traits and eliminate traits we did not want. A good producing cow was mated with a good strong bull who had a history of producing good quality cows. The process became ever more easier with the advancements in technology in the 20th century. Books like the Hoard’s Dairyman were, and still are, devoted to the best of the best sires and dams (males and females) in the Dairy Industry. The goal? Farmers want to increase their income, and feed the human race, through more productive cows, so they breed accordingly! With the latest technology in plant breeding, we see huge advancements in plant selection and reproduction. So where exactly do we draw the line on what is a Genetically Modified Organism? Farmers have been planting corn varieties next to each other, that when mixed, produce great yields since the turn of the 20th Century. The Ag industry today refers to these as Hybrid crops. 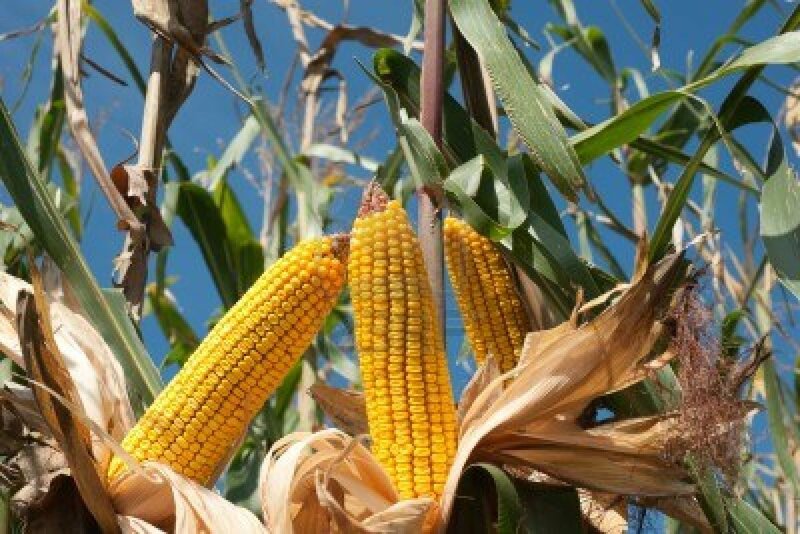 Is hybrid corn a GMO? Is a cow, bred with such selective intent on specific features, a GMO? Where is the line drawn between an organic or all natural animal or plant? I am looking forward to you continuing the conversation in the comments below!!! Today, I’m going to take another particular angle on the GMO debate. For more points, see other posts in my blog. It is almost becoming exhausting… all the debate over GMO’s. However, do you know what would be really troubling? Imagine we had to take the low cost option of food off the shelves at our local grocery stores… simply because it incorporated GMO’s. Also consider that removing GMO’s may reduce the supply of food significantly, driving prices higher than ever. How would that impact our society? Well, there has already been quite a trend since the recession… the rich get richer and the poor have gotten poorer. Remove GMO’s from the grocery store shelves… and the trend is exponentially increased. The fact remains that no one has scientifically proven GMO’s to be harmful. Secondly, even if they were remotely harmful… the idea of crippling the ability of the lowest class of society from being able to afford food would be even worse. The amount of funding for food stamps was reduced in the 2014 farm bill, and will continue to be reduced as pennies in congress are pinched. Meanwhile, prices of food continue to go higher. Those who are left out of the conversation, are those who matter most. Unless GMO’s are going to destroy the human race, or those of us in the middle to upper class are willing to pay for food subsidies for the lower class, we need low cost options on the shelves of our grocery store for the lower class to provide for their families. Feel free to post your thoughts! What have you been told about Bio-food and Biotechnology? What are your thoughts about genetically modified crops? On a weekly basis I run into people who talk about how bad GMO’s and Biofood is for us. The funny thing though is that most of those people really have no facts, because they are simply believing the myths that the media circulates. Look, the media has to get people’s attention to make money. So even if they don’t know all the facts, and are not sure if its true, they will publish their thoughts anyways if its an interesting story. Its how they make money. Well I’m here to try and show each one of you the truths about GMO’s and Bio-food, so that you can feel confident in purchasing wholesome food for your family. So do you want some facts about GMO’s and Biotechnology? Well I found a great document that was put together by the United Soybean Board, check it out: Myths About Agricultural Biotechnology and Biotech foods. If you look at the link above, you will find that the United Soybean Board did some research both in the United States, Europe, and Emerging Countries. The European Union, which in the past has experienced high consumer anxiety over Genetically Modified food, along with the United Kingdom have both come forward and have found that Biotech Food is safer for human health than conventional methods. What about Allergies and Antibiotic Resistance? Truth is that the European Food Safety Authority (EFSA) has found that food allergies have actually decreased since the introduction of Genetically Modified (GM) food. GM food can be created in such a way that the allergy causing genes are removed, thus making food safer for consumption. The EFSA has also found that GM food has not shown any increase to human antibiotic resistance. The EFSA has found that antibiotic resistance is growing due to over-prescribed medication and medication dependency. Interesting, is it not? With the new Genetically modified seeds available to farmers, farmers use less pesticides. Since we can now alter the seed genetic makeup to withstand disease and withstand being killed by stronger pesticides & herbicides, farmers use less chemicals than they did before. The article shows that chemical applications have been reduced by 50% or more in most countries where GM crops are being grown. That is great news for both humans and the environment! Check out the rest of the article for more great facts. Did this article help you feel more informed about GMO’s and the food you are eating?